Generally doing actual practice pieces isn't my M.O. and I usually jump right in and go to town on something. But for this, I felt that I needed to do a few test runs to get an idea of how I wanted to do it and the mixes/steps to do it all in. For this test I decided to dual prime, also something I usually don't do. I don't see the point of it most of the time. Once the model is painted it doesn't seem to be noticeable to me anyway, in most situations. But the thin coats of Ushbati Bone and translucency of the paint may be helped by it. After painting a base coat of Ushbati Bone over the entire piece and highlighting it up to white, I realized that I needed a darker starting point. 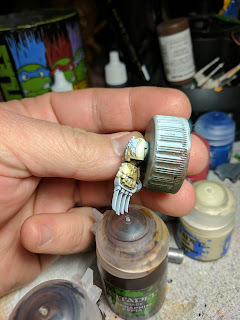 So I mixed up some XV-88 and Usbhati Bone for the dark areas to help shade it more. I think this mix was 60/40 or maybe even 80/20, Ushbati Bone/XV-88. It seemed to work well, but I think I need to go even darker. 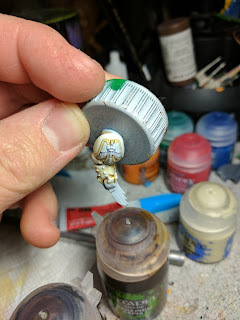 So on my next test I'm going to start with a base coat of straight XV-88 in the shadows and straight base coat of Ushbati Bone on the light areas and see what happens. 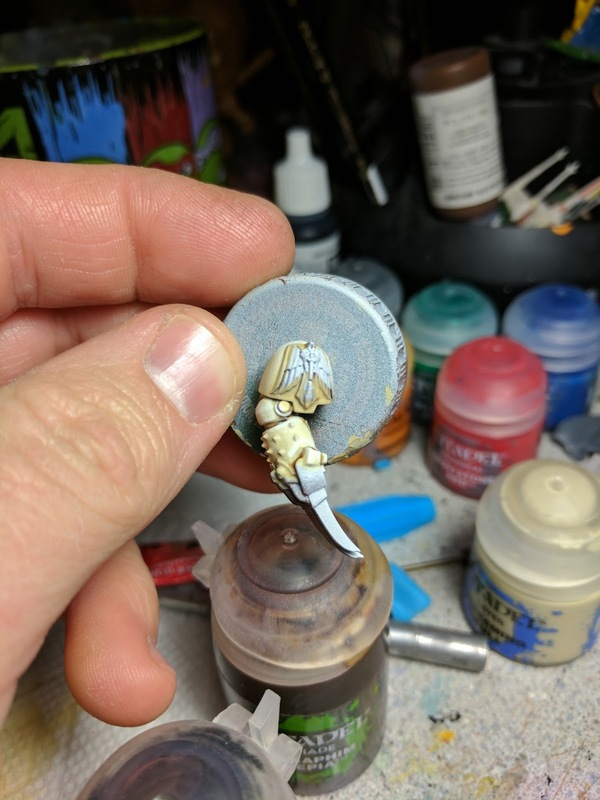 I've found that I tend to stop shy of drastic contrast on my minis, especially on light colors. I need to up my contrast game a bit. I've already begun fixing this issue on my metals, but the game needs to level up on some of my regular painting too. This is an excellent time to do just that. That's it for now. 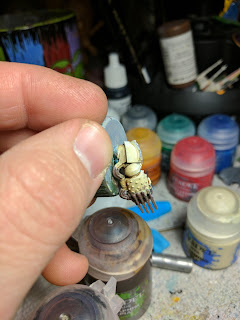 Sadly since Crystal Brush rules state that models for competition entry can't be shown online before competition. I don't agree with it, but what can you do. This means some radio silence for a bit from me. But, I'll share any test pieces I use during the process. After talking to Greg in the comments I decided to look over the entire rules again and it seems I misread the section about not being shown online. So I guess that means I can post about the build on here and social media. Hurray! The rule only applies to "other competition or exhibition". I've never been denied submitting something I had WIP's on my blog. Then of course, the competition is beyond fierce, so I've never even come slightly close to being a finalist, not even my dakkajet! c) Entries must not have been shown online or in print media, or announced as winners, in another competition or exhibition. Entries must not have been published in any professional or commercial media, either print or online, including but not limited to hobby magazines, manufacturer catalogs, advertisements, box art, or gaming materials such as character cards and rule books. basically you can't use them commercially, or in another competition to submit to crystal brush. That being said, they usually don't care unless you are in the finalist stages. Then they will disqualify you, but you will still be allowed to be on display. Ha ya, I don't expect anything out of it. Just having excellent minis on display at the event is my ultimate goal.